A good sequel to Earthquake Shock. I can’t wait to read and review the next two books: Volcano Blast and Blizzard Night! The book is about a boy who appreciates his family more after he is separated from them. Did you know: Tornado Alley is the name given to a strip of land that runs from Texas to North Dakota. This is where the most tornadoes occur in the U.S.
Wyatt’s cousin, Alison, has come to live with him and he is already fed up. She is perfect in every regard. She is a prissy who loves pink. Wyatt’s friends come to visit him and the four of them get stuck in a tornado. 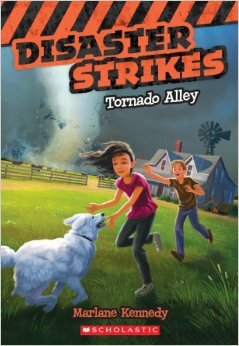 They get to a tornado shelter but Alison runs out to save their dog, and ends up almost running into the tornado. Wyatt runs after her, endangering himself in the process. When the two of them are reunited with their other friends, another tornado appears. The four of them get on four-wheelers and try to out-drive the tornado but as it gets closer, all hope seems lost.